The European Region of Gastronomy Platform welcomed a new candidate for the Regions of Gastronomy 2021 title. The Region of Coimbra (Portugal) announced its bid on 22 May 2018 at the Escola de Hotelaria e Turismo de Coimbra, after signing a protocol agreement with the International Institute of Gastronomy, Culture, Arts and Tourism (IGCAT), represented by its President, Dr. Diane Dodd. The region gathers 19 municipalities that are committed to capitalise on their food and cultural diversity to respond to the challenge of becoming a European Region of Gastronomy. According to the President of the Intermunicipal Community of Coimbra Region (CIMRC), João Ataíde, the region, due to its peculiarities in terms of gastronomy, culture, traditions and landscape, has what it takes to successfully obtain the title in 2021. The candidacy was put forward by a stakeholder group led by the CIMRC and including: Dueceira; Coimbra Mais Futuro; Adelo; Adiber; Lousamel; Associação da Hotelaria, Restauração e Similares de Portugal (AHRESP); Pinhais do Zezere. Stakeholders met on 7 May 2018 at CIMRC headquarters and agreed to join the European Region of Gastronomy Platform, responding to IGCAT’s requirement to reach a consensus among public, private, third and education sectors. Furthermore, an Executive Committee was set up to coordinate the implementation of the region’s programme, gathering the following partners: CIMRC; Entidade Regional Turismo do Centro de Portugal; Comissão de Coordenação e Desenvolvimento do Centro; Universidade de Coimbra; Instituto Politécnico de Coimbra; Escola de Hotelaria e Turismo de Coimbra. The region’s candidacy is based on a strong cross-sectoral collaboration. As First Secretary of the CIM Intermunicipal Executive Secretariat Region of Coimbra, Jorge Brito affirmed, that the region’s efforts are not address only to gastronomy, but involve different sectors working together, such as tourism, culture, and the economic sector, to name a few. Furthermore, he stated that 30 entities on the territory have alteady signed up to the project. 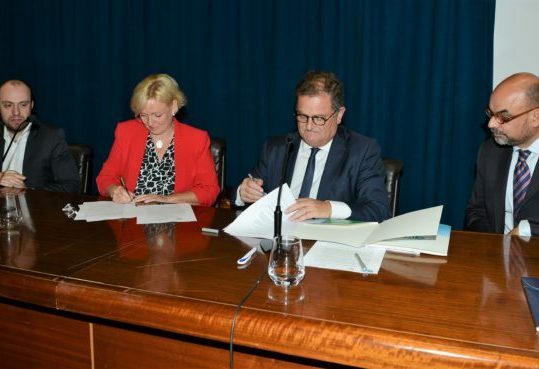 By signing the agreeement, the region committed to be a member of the European Region of Gastronomy Platform for 5 years, during which it will support and promote the European Region of Gastronomy principles and aims, as well as work in collaboration with the other regions in the Platform. The region also agreed to involve in its programme a wide range of regional stakeholders, including food producers, food festivals, educational institutions and other hospitality and cultural organisations. If successful, Coimbra Region’s candidacy will be officially announced in October 2018 in Brussels, in the framework of the European Week of Regions and cities, alongside Slovenia, the other candidate European Region of Gastronomy for 2021. IGCAT is a non-profit organisation working in the fields of gastronomy, culture, arts and tourism. Through its worldwide network of experts, IGCAT aims to empower local communities by guiding, facilitating and supporting local leaders in regions to understand the potential of their distinct food, culture, arts and sustainable tourism assets. IGCAT provides the Region of Gastronomy Award and is the official secretariat for the European Region of Gastronomy Platform. Furthermore, the Institute has developed the European Young Chef Award, the Local Food Gift Challenge, the Top Food Experiences of the Year and the Food Film Festival project. The European Region of Gastronomy Platform aims to contribute to better quality of life in European regions, by highlighting distinctive food cultures, educating for better health and sustainability and stimulating gastronomic innovation. Candidate regions are invited to join a knowledge-exchange platform of European regions in order to further cross-border collaborations and develop shared initiatives.